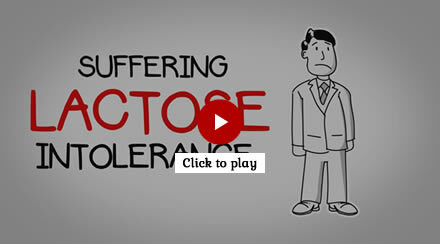 The inability to digest milk sugar called lactose is due to deficiency of lactase in the gut. Lactase deficiency leads to Lactose maldigestion which results into Lactose intolerance with various GI symptoms like abdominal pain, bloating, gurgling sound of intestine, gas, nausea, vomiting & diarrhea. Besides the milk based dairy products, lactose can also be found in many prepared foods & drinks (hidden dairy) and cause Lactose intolerance. 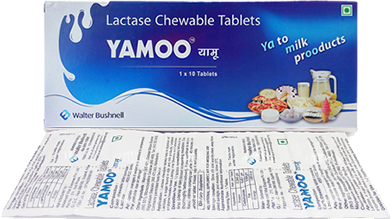 For the Natural & Safe management of Lactose Intolerance, Yamoo tablets (Lactase enzyme chewable tablets) have been introduced for the first time in India that helps break down lactose, and thus help relieve the symptoms of Lactose Intolerance. Lactase chewable tablets are a dietary supplement that naturally makes dairy foods more digestible. Lactase chewable tablet contains a natural enzyme lactase obtained from fungi, Aspergillus oryzae that helps break down lactose, the complex sugar found in dairy foods. Direction for use: 1-2 tablets immediately before or with first bite/sip of dairy (lactose) containing meal/drink. Chew thoroughly before swallowing. If you continue to consume foods/drinks containing dairy after 20 to 45 minutes, take another tablet. If missed, take it immediately.